Figure： showing a new model including seawater like saline fluids liberated from downgoing oceanic plates underneath island arcs. Slab-derived fluids play an important role in heat and material transfer in subduction zones. Dr. Tatsuhiko Kawamoto, Dr. Masako Yoshikawa, and Mr. Yoshitaka Kumagai of the Graduate School of Science suggest a new model including seawater like saline fluids liberated from downgoing oceanic plates underneath island arcs (Figure). Dehydration and decarbonation reactions of minerals in the subducting slab have been investigated using phase equilibria and modeling of fluid flow. Nevertheless, direct observations of the fluid chemistry and pressure-temperature P-T conditions of fluids are few. 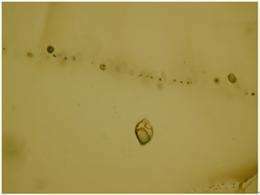 Dr. Kawamoto and his colleagues found CO2-bearing saline fluid inclusions in spinel-harzburgite xenoliths, which Dr. T. Kobayashi of Kagoshima University, Dr. M. Okuno of Fukuoka University and Dr. M. H. Mirabueno collected from the 1991 Pinatubo pumice deposits. The fluid inclusions are filled with saline solutions with 5.1 plus/minus 1.0% (wt) NaCl equivalent, magnesite crystals, CO2-bearing vapor bubbles, and a talc and/or chrysotile layer on the walls (Photo). Photo：Under polarizing light microscopy showing fluid inclusions composed of magnesite, saline fluid and vapor bubble in an olivine crystal of the Pinatubo harzburgite. The width is 0.25mm. The xenoliths contain tremolite amphibole, which is stable in temperatures lower than 830 degrees of celsius at the uppermost mantle. The Pinatubo volcano is located at the volcanic front of the Luzon arc associated with subduction of warm oceanic plate. The present observation is the first report suggesting hydration of forearc mantle and the uppermost mantle by slab-derived CO2 bearing saline fluids. Dehydration and decarbonation take place and seawater-like saline fluids migrate from the subducting slab to the mantle wedge. There are Arima-type spring water such as Arima, Takarazuka, Shirahama hot springs, and Ishibotoke (cold water) in Kinki district in southwest Japan arc, where young and warm Philippine sea plate is subducting beneath Eurasian plate along Nankai trough. The Arima-type hot springs are characterized by CO2-bearing highly saline fluids and mantle-signatures of helium, hydrogen and oxygen isotopes according to the previous studies. Dr. T. Kawamoto suggests that the Arima-type hot springs are originated from the downgoing oceanic plate at 30-60 km depths and equilibrated with mantle peridotite. 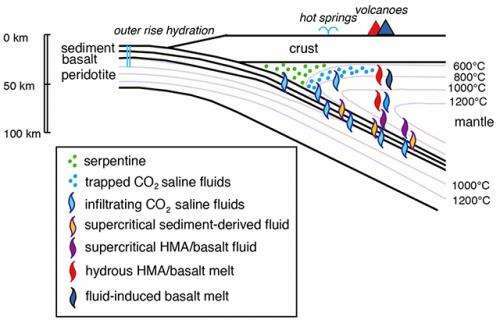 The presence of saline fluids is important because they can dissolve more metals than pure H2O and affects on the chemical evolution of mantle wedge.